It is probably fair to say that the traction advantages of four-wheel drive were first seen on steam locomotives. Where automobiles are concerned, it all started with the Spyker, conceived in 1902 by Joseph Laviolette. Several four-wheel drive hillclimb specials followed. There was the 1931 T53 Bugatti. Harry Armenius Miller, visionary that he was, had a four-wheel drive Indianapolis car running in 1932 – others followed, though none were very successful. After the war there was the ill-fated Porsche-designed Cisitalia Grand Prix car, but then not much happened until the brilliant Harry Ferguson marshalled his tiny company’s resources and produced the 1.6-liter Climax engined P99 in which Stirling Moss won a streaming wet Oulton Park Gold Cup in 1961. In the light of subsequent events, we can only suggest why the P99 was demonstrably superior in the wet at Oulton Park and Aintree, because under 4×4 GP cars did not enjoy the same success. Jack Fairman took the car to Indianapolis for tests, where it impressed the likes of Andy Granatelli (CEO of STP as well as a major figure in automobile racing) with its speed through the turns. The Granatelli-financed supercharged Novi V8 Ferguson Indianapolis cars followed, and bits and pieces of these were actually incorporated into the STP Paxton turbine car that would have easily won the 1967 race but for a transmission bearing failure seven miles from the finish. Lotus’ Colin Chapman and Andy Granatelli clearly felt four-wheel drive was the way to go, even though the STP Paxton car’s performance had prompted the governing body USAC to reduce the turbine inlet annulus from 23,000 sq. in. to 15,999 sq. in., which would limit outputs to about 500bhp. Chapman was right. After a disastrous test session when Mike Spence was killed, it was Joe Leonard and Graham Hill who occupied the first two places on the grid for the 1968 race. Hill crashed, but Leonard and Pollard could have won but for the failure of “fail safe” fuel pump shafts fitted at the insistence of Pratt and Whitney engineers. Later came the Bignotti Lolas, which were also quick with a Hewland-developed four-wheel drive system. Picture the scene back in Europe. 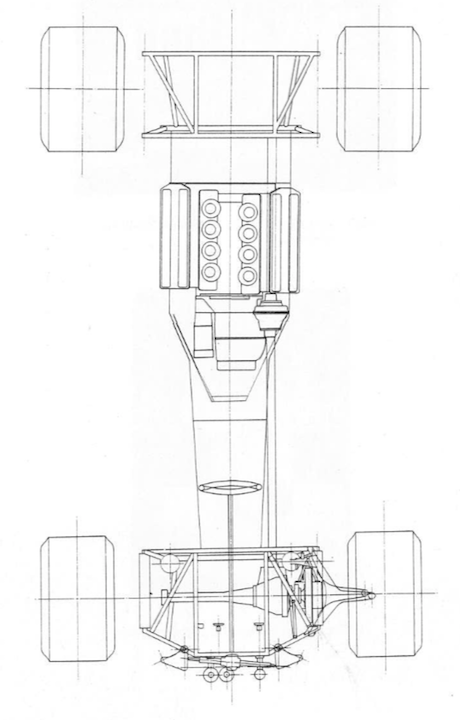 In 1968 Grand Prix cars were sprouting massive suspension-attached wings (Figure 1 above), which were beginning to break up as designers applied more and more downforce. 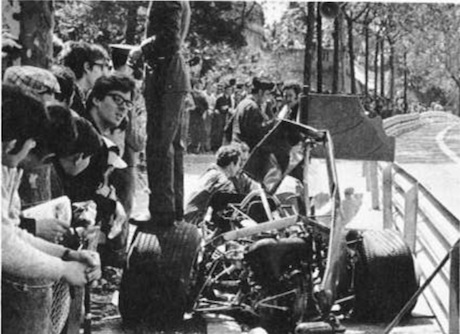 At the Spanish Grand Prix both Jochen Rindt and Graham Hill had potentially fatal accidents on the streets of Barcelona (Figure 2). Without thought the CSI reacted by banning wings altogether, then compromised by permitting far smaller body-mounted aerodynamic devices. Meanwhile Chapman and Duckworth were already working their four-wheel drive GP cars. Suddenly those teams with four-wheel drive programs seemed to hold all the aces, and for Lotus there was the 56B Formula One turbine car to come. The design philosophy in the 4×4 GP car was to get as close as feasible to a 50/50 weight distribution. By definition most of the 4×4 contenders had a longer wheelbase than their RWD counterparts. They also had heavy drive componentry added up front, specifically the forward drive casing, gears, differential, plus drive shafts, and the encased shaft running forward from the torque split, which was usually of Ferguson epicyclic design, all of which added around 130 lbs in weight (Figure 3). They all had their Cosworth DFVs turned through 180°, and mated to a specially developed clutch housing and foreshortened Hewland gearbox, before the drive was stepped sideways by gears to the torque split unit on the left hand side of the driver. Even without the addition of drive to the front wheels, none of these extra components contributed to handling response. What four-wheel drive enthusiasts could not have anticipated was the huge improvement in tires that occurred over the next season, or how much downforce could be achieved, even with the much smaller body-mounted aerodynamic devices that replaced the suspension-mounted wings. As it turned out RWD Grand Prix cars simply did not have the expected traction problems. 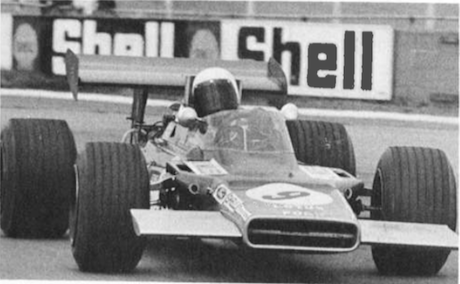 On the other hand, four-wheel drive GP cars of the 1969 season did suffer from several undesirable handling traits. Before detailing these, it is important to explain the function of the driver in a conventional rear-wheel drive racing car. Regardless of the amount of power or grip available, the driver depends on manoeuvrability, i.e. response. The driver also needs a car that is in balance, because a car that is neither understeering nor oversteering significantly is making best use of the tire grip available at each end. It is well understood that racing cars (and road cars for that matter) depend for their balance on the careful tuning of springs, dampers, anti-roll bars and aerodynamic downforce when applicable, but even then a driver is only likely to be able to tune a car to perfection for corners in a certain speed envelope. Ultimately he depends on his ability to modify the balance of the car with instinctive movements of the steering and throttle. He is constantly and instantaneously making tiny adjustments in balance as the car is sliding. In most circumstances this ability to instantaneously maintain control over both ends of the car is also considered vital as track conditions change, or the adhesion limit is overstepped, or simply to accommodate different driving styles. Our experience showed that by “coupling” the front and rear, the driver lost this flexibility of control. Talk to the driver of any four-wheel drive racing car, Stirling Moss included, and they will describe a loss in controllability; a loss in the ability to balance the car with steering and throttle. Lack of straight-line speed was often cited as a reason for the slow lap times achieved by most FWD GP cars. My experience was that the Lotus 63 was 2-3mph slower on the straights, but the principal reason for disappointment was the lack of manoeverability, reduced controllability, and understeer (Figure 4). The rally car case is a special one where the drivers use left-foot braking and other techniques to overcome the lack of conventional controllability. In motor racing there is more grip available, so such techniques are not feasible since one cannot afford any waste of engine power. The reactions and sensitivity necessary would also be beyond even the best driver’s capabilities, since the speeds involved are so high. The key point is that whereas the balance of a RWD racing car is ultimately in the hands of the driver, who has control of both ends of the car, the balance of a 4WD racing car is essentially “in the car”. In testing the Lotus 63, this was made all too clear. Regardless of its deficiencies, all drivers achieved the same lap times quite easily, whereas it took me two or three times the number of laps to get within half a second of Jochen Rindt if we were testing a RWD Lotus 72. This was because he had a finer feeling of balance and the better car control that goes with it. He could fully exploit the 72, whereas the Lotus 63’s balance was inbuilt, leaving its limits well defined and barely alterable. For most of the season, torque splits were in the 40/60, 30/70 range. With this kind of torque balance it was a directionally stable car: too stable in fact. Except at very low speeds, understeer was always the limitation. If one turned into bends on a trailing throttle, or under braking (a normal RWD technique) the car would start swinging rather pendulously into oversteer, and there was no point of maintainable balance between these two extremes. Steering loads were also high. Set up slinging on its ideal line there were few controllability problems, but if you went into a corner a little too fast or on slightly the wrong line, one could only lift off the throttle and wait for the attitude to change before starting all over again. The car did not respond to small movements of steering and throttle, which could have re-balanced a RWD car according to the driver’s wishes. In the quest for better balance (less understeer) the amount of torque to the front wheels was progressively reduced as the season wore on. It is now clear that this attempt to make a four-wheel drive racer with close to 50/50 weight distribution behave more like a rear-wheel drive car was not the right way to go. I now feel that improvements in lap times were due more to chassis and aerodynamic development than changes in the torque split. For example, we started the season qualifying around 4.5 seconds behind pole position man. The best practice performance was at Mosport, where the 63 (with a 30/70 torque split) qualified 2.6 seconds behind Ickx’s pole-position Brabham. Earlier in the year Mario Andretti had crashed a 63 at the Nurburgring after qualifying second to last. At the Oulton Park Gold Cup Jochen Rindt practiced three seconds slower than pole position and managed a distant second (its best race finish), 82 secs behind in a poorly supported 40-lap race. Otherwise it was gearbox and/or fuel pump problems, or crashes that side-lined the car. By this time McLaren had long since given up any deal of pursuing the concept. Tyrrell was soldiering on with its out of date (and torsionally unrigid) spaceframe MS84 with very little more success than Lotus, while the Cosworth never got beyond the testing stage (Figure 5). Those who persisted could not wait for it to rain. Colin Chapman and Mario Andretti got their wish during practice for the US Grand Prix at Watkins Gen. Mario did 1m 19.6 sec against Jack Brabham’s 1m 13.84 sec, compared with Rindt’s 1m 13.62 sec. Mario was fifth from slowest on both occasions! Not long after I had the opportunity to drive a 63 at Snetterton in the wet, and understood why Mario hadn’t shone at Watkins Glen. By this time the car was running a 12.5/87.5 torque split, making the whole concept of four-wheel drive utterly pointless. Such a torque balance did reduce the understeer, especially in slow corners where the grip of the tires could be overcome, but the car was still terribly ungainly; the rear slid ponderously outwards, while the drive applied liberal quantities of opposite lock with the steering heavying up uncomfortably. In the same situation the RWD racers would turn in far quicker, get the power on, and be nicely balanced, powering neatly out of the same hairpin with little if any wheelspin. They had the response, the control, and no lack of grip, even at speeds where the aerodynamic aids were least effective. In the wet, one only had to begin to feed in the DFV’s considerable torque to set the rear wheels spinning, driving the car into a pendulous slide. In the wet there was far more power than traction and even less control. The “torque” balance totally dominated, and I vividly recall spinning as soon as any decent throttle opening was applied and there was nothing whatever I could do about it. In retrospect, it was silly not to have developed a limited slip device for the center differential, as this might have moderated the sudden rear wheelspin present in poor conditions. Other comments supplied for this paper on the subject of four-wheel drive competition car handling make interesting reading. “Once wings had arrived, any benefit of four-wheel drive had vanished. I refused to go below 30% to the front wheels on the grounds that if you could not make it work with that it was no good, because you could not justify the weight, complication and reduced response. With that much torque going through the front wheels you always have the potential for front wheel spin (although modern limited slip devices might reduce the problem, which obviously increase as the power to weight ratio goes up). We had a true 50/50 weight distribution, the same geometrics, and the same wheels and tires, to try and make a balanced car. That put us in the position of having to use limited slip diffs front and rear. We couldn’t even get round the normally flat out Abbey curve at Silverstone without lifting off because the diffs were effectively locked and the car wanted to go straight on. 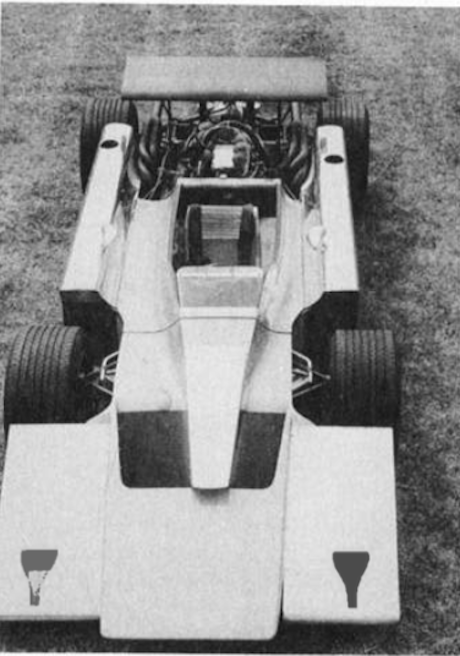 An Indy 4WD car with a turbine engine was a totally different matter. First, we had evidence of the STP car from the previous year as a guide on the high-speed handling and then there were the turbine engine’s characteristics. This made driving the long turns at Indy a relatively smooth affair, as the turbine was never allowed to idle at less than 80% gas generator speed, and the brakes were used to control speed and initial acceleration against the idle drive of the engine. All this with a 40:60 torque split amounted to a reasonable performance with 550hp available at 110% gas generator speed. When Cosworth threatened to build a 4WD GP car, several teams followed suit (despite misgivings). If Keith was going to do it, then it had to be the way to go! The Cosworth car had the shortest track life of any GP car, 4WD or not! Meanwhile, Lotus amongst others soldiered on to a final conclusion. Now we can’t use 4WD any way due to legislation. However, you should note that we are now handling up to three times the power available during the 3-liter unsupercharged formula, and two wheels seem to cope reasonably well despite limitation on tire size. “The BRM T67 was 12mph slower on the straight at Snetterton in the hands of Richie Ginther and no faster through the corners, so we lost interest, particularly as we were neck and neck with Lotus and a revised Ferrari for the world championship and we could no longer spare something like 25% of the effort in men and resources to work on the car. 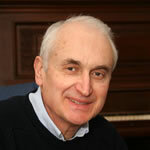 Mike Pilbeam (designed at Lotus and then ran his own race car design company). 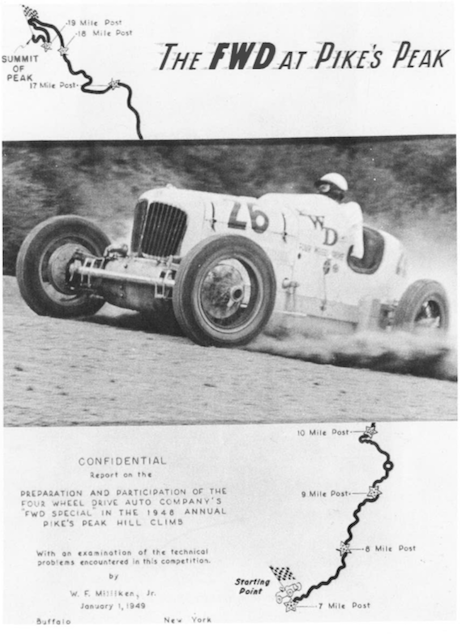 Bill drove Archie Butterworth’s 4×4 special ‘Butterball’ and the Four Wheel Drive Auto Company’s ‘FWD Special’, a four-wheel drive Miller, the latter into sixth place at the 19-mile long Pike’s Peak hill climb in 1949 (Figure 6). The surface is loose gravel and dirt. He ran the car with the central differential unlocked and locked, and found that on loose surfaces a fixed transmission system was essential in preventing random wheel slip. “It did have some advantages – stopping and starting on wet roads – but the car was impossible to drift. Whatever direction you aimed it that was the direction it went. Accuracy and a tendency not to hesitate were called for. I couldn’t handle that. The strength of Hercules was also called for. That I couldn’t.” (Figure 8). For Riverside he ran torque splits in the 30/70 or even 20/80 range (Lotus ran 45/55 at Indy) and liked the car’s balance –though he crashed the car. “The heavy steering wasn’t a problem. The biggest problem was the front end understeering under power and not being able to get rid of the understeer either by deceleration or trailing throttle going into a corner and reapplying power. You would get the car going into a “half neutral position”, apply the power, and you had to be a real artist to be able to catch it at the right moment to have what would really amount to having a four-wheel drift. It only happened once every six corners. You were doing a balancing act to accommodate the inadequacies of the front end not to take control. Altering steering and throttle didn’t have the same effect in getting more grip at the front end, or breaking away the rear as it would in a rear-wheel drive car. That was the frustration of it. In a course like Silverstone for example where you were going through long radius corners it was worse because you had to live with this feeling for a longer period, whereas if it were a stop and go type of situation it might have been more bearable. While other teams gave up in disgust Colin Chapman persisted. He wanted a “second string” car that could at least guarantee a finish – hence the Lotus 56B. The Pratt and Whitney PT6 turbine was a trusty unit in helicopters and the Indianapolis breakdowns had only been silly failures. United Aircraft co-operated by providing technical back up and a PT5, with two stages of the three-stage axial gasifier removed to improve response. Starting a race with 75 gallons of JJP4 fuel aboard the 56B ran heavy compared with a piston-engined car. It was virtually an Indianapolis car with Formula One wings, the drive being taken straight from the turbine output shaft to the epicyclic torque splitter via a Morse chain. There was no gearbox of course, and just two giant pedals either side of the steering column. Like any turbine it only started producing real power between 80 and 100% of its gasifier’s output. Throttle lag was between two and three seconds, which was obviously a problem on European circuits, whereas at Indianapolis, speeds were so high there was much less of a response problem. By virtue of the speeds involved, steer angles were tiny and there was far less excess torque available. Even with the 45/55 torque split used, understeer did not seem to be a problem, whereas the gain in stability at the very high speeds involved was considerable. The Formula One 56B had huge ventilated discs and double thickness pads. Even so, with 70bhp going through the transmission even with right foot off the throttle, brake pad wear was phenomenal. Braking had to be initiated earlier than in RWD car, then now had to start building up the power against the brakes on the entry to the corner. Before the apex, both feet were planted firmly on both pedals balancing huge contradicting forces. Your right foot was hard down to the throttle and to accelerate you eased back progressively on the brakes. Clearly, the faster one lapped, the more the brakes came into play. It was a car that required even more planning and commitment than the 63 to drive at the limit. It was also wonderfully quiet; there was no vibration. The roar of the exhaust seemed to get left behind the faster the car went. Over bumps you could hear the pads rattling in the calipers, the clattering of the solid-jointed suspension, and there was usually some tire squeal in the dry. I left Lotus after Jochen Rindt was killed in practice for the 1970 Italian Grand Prix, so never got to race the turbine F1 car. In the dry it was only a low-to mid-field runner with Fittipaldi, Wisell or Walker. By contrast it showed real promise in the wet. 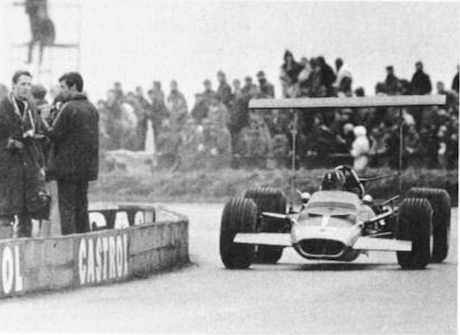 Fittipaldi qualified in the middle of the front row at Brands Hatch (1971 Race of the Champions), which was hardly suited to the car or driving techniques involved. At the beginning of the 1971 Dutch Grand Prix the weather changed for the worse, and the relatively inexperienced Dave Walker went from 22nd place on the grid to 10th in five laps before crashing. For a moment four-wheel drive looked good, just as it had been for Moss a decade before. Now it is banned in both formulae, so we can only make some suggestions as to why the turbine worked reasonably well in the wet (when four-wheel drive was supposed to come into its own) and the 63 didn’t, and why the Ferguson P99 went so well. Before he died, I spoke to Colin Chapman on the subject. He felt that the wet weather behavior of the turbine cars was due to their power characteristics. There were none of the sudden on/off torque reversals present in a piston-engined car. He also felt that four-wheel drive worked best in situations of low driving torque, i.e at high speeds when the stability gain was really worth something, or in the wet when the smooth turbine power curve was a distinct advantage. In fact there may have been more to it. We shall never know how much of the turbine’s wet weather performance was due to tires (the 15in diameter wheels and tires would have given a longer contact patch), but I have felt the steadying influence and reduction in body movement left foot braking can have, a technique drivers of the 56B had to adopt. Left-foot braking appears to inhibit the unpleasant attitude changes due to weight transfer. It is also better understood that a tire may generate more concerning force while being simultaneously subjected to moderate braking. The transition to an accelerating mode in a turn would be very smooth with left-foot braking. It has also been suggested that he almost continuous braking action could also have been acting like a very effective wheelspin-limiting device (some manufacturers are now using the brakes to limit wheel spin). Disregarding the Indianapolis experience, the Ferguson P99 stands out (as Stirling Moss’ experiences testify) as the only really successful four-wheel drive Grand Prix car, in the dry when four-wheel drive was not expected to excel. On the first day of practise for the British GP at Aintree it was dry and Moss recorded 2m 00.6 sec. Fastest man, Phil Hill, (Ferrari) returned 1m 58.6 sec. Practise the following day was damp, and Moss was fastest with 2m 01.6 sec (astonishingly close to his dry weather lap time), no less than 4 seconds faster than Salvadori (Cooper). Next up was Von Trips’ Ferrari with 2m .06.0 sec. 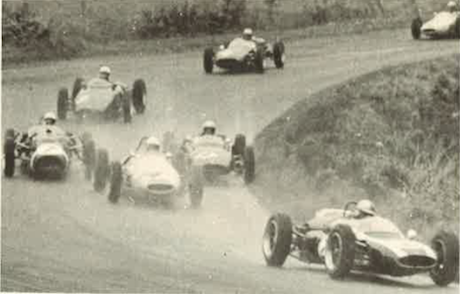 The race was wet and when Moss took over from Jack Fairman, he started lapping two seconds faster than the leaders, returning a 2m 00.8 sec lap before the car was disqualified for an earlier push start. At the Gold Cup, Moss put the Ferguson in the middle of the front row with 1m 44.8 sec, 0.2 sec behind pole position man Brabham in a Cooper. The race was mostly damp and Moss won by 45 seconds. Its 1 ½ litre Coventry Climax engine would have been producing around 160bhp, even with a dry weight of 1,090 lbs. This fact coupled with a lack of downforce and much narrower tires clearly prevented some of the problems experienced in later four-wheel drive GP cars. The Ferguson also had Maxaret anti-lock brakes and a “Monolock” spin limiting system in the center differential, effectively preventing more than 5% over spin at the rear and 10% at the front end, but allowing free inter-axle rotation up to those limits. With such low power, no limited slip units were found necessary. That said, we shall never really know if its competitiveness was due to the relatively poor state of rear-wheel drive GP car design, or a combination of the above factors. One must also consider that the behavior of the front-engine car when braking, accelerating (when the front tires could be expected to do more work) and cornering with its 60/40 weight balance (dry) and very different mass distribution, which may have also influenced the result. 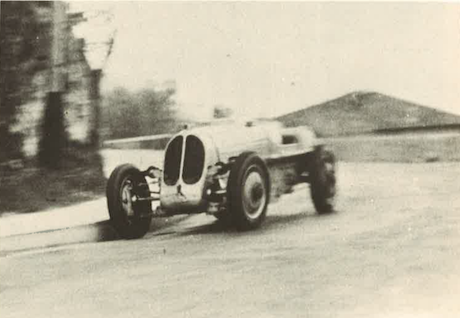 As history relates the Ferguson P99 (with 2½ litre Coventry Climax installed) and the BRM P67 driven by Peter Westbury and Peter Lawson respectively won RAC Hill Climb Championships, but again that was in an age before aerodynamic downforce and super-wide tires. As in the rally car case, the traction gain probably outweighed any handling disadvantage. Also, the handling requirements for narrow bumpy lanes are far more like those found on country roads and quite different from those of the average circuit, where the car is sliding for a much longer period and at much higher speeds. Aerodynamic downforce and tire development may have saved RWD, but as things stand, my own view is that it would be difficult to imagine four-wheel drive staging a comeback in Formula One or at Indianapolis (even if it were legal in either) if it were to involve a sacrifice in maneuverability. This also suggests four-wheel drive needs to be interfaced in a highly maneuverable platform such as the Peugeot 16T rally car, to a point where the driver could not cope with the response in rear-wheel drive form. In addition four-wheel drive should not involve the imposition of a fixed torque bias as this has hitherto involved some sacrifice in driver control and handling response. Technical editor John Miles was a major industry figure, known initially for motor racing in the 1960s, including F3, F2 and GT racing at Team Lotus, and F1 racing in the 1970s. He began contributing to Vehicle Dynamics International in 2002 and was part of the team until his passing in 2018. John had vast experience, having spent 18 years at Lotus Engineering, three years at Aston Martin, and 13 years at Multimatic Chassis Engineering.